Yesterday I ran in the Jumbo-Holdsworth race. This is a 23km mountain run with a nice run along a river valley, some serious climbing as you head from Atiwhakatu Hut to the peak at Jumbo, along the ridge from Jumbo to Mt Holdsworth and then downhill to the finish. I knew my legs were tired and not is great shape so I took it easy along the valley. I felt alright as I climbed 900 vertical metres to the summit of Jumbo. I even passed a few people on the ascent. Between Jumbo and Holdsworth there are three climbs and it was only on the second climb along the ridge that my legs started to say, "Hey mate, we feel stuffed." However, being able to see the trig that marks Mt Holdsworth, you tell your legs to keep on going and soon you arrive. I arrived at the end with a slower time than when I last completed the race, but my second quickest time for the seven times I have run the event. I was happy to have finished. 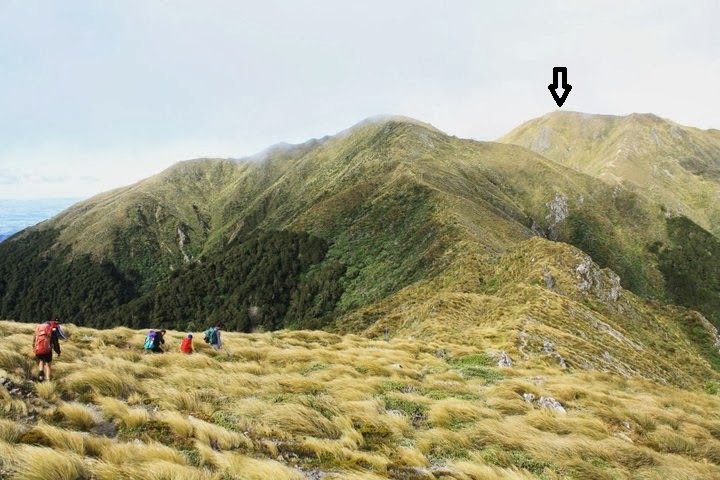 Below is an old photo of the ridge between Jumbo and Mt Holdsworth. I took this when I was tramping with my sons quite a few years ago. The Mt Holdsworth trig is indicated by the arrow. So when you reach the finish, what is the reward? The answer is the same as the last time: beer and sausages. There is a BBQ put on for all contestants and I brought two lots of sausages to share with friends. The old faithful Park Ave Quality Meats, kabanosy, see link, and a new sausage I had purchased from the Kelburn shop of Cameron Harrison Butchers, the Black Rock pork sausage. The butcher in the shop told me it was made by Cameron Harrison using a recipe from an Auckland butcher. This sausage had won awards, he told me. When I asked what they were, he did not know. Sadly this was a continuation of previous conversations I have had with the staff who work for Cameron Harrison. They have poor product knowledge, and Cameron Harrison really needs to do something about it if they want their staff to do justice to the quality sausages and other meats they sell. The Black Rock pork sausage is pure pork. It tastes good, and when I cooked (and sampled) them the night before, the sweetness of the pork was the paramount flavour. It is a medium grind and tastes good between the teeth - you know you are eating a quality pork sausage. I will buy this sausage again. The runners who ate the sausages thought the kabonosy was the best, they liked the smokiness. This flavour remains when the sausages are cold. The Black Rock pork sausages were also appreciated. The flavour of the pork is not as marked when cold so these sausages are best eaten while warm. You can see I left the fine china and silver cutlery at home. A plastic bag and fingers make for great eating. I talked with the winner of the race, he runs for the same club as I do. They then announced the race was about to begin, line up! He headed for the front row, while I jostled with other runners for one of the back marker spots. I offered the winner a sausage at the end of the race and strangely he declined. He obviously does not appreciate the merits of the innovative and ground breaking sausages and running regime that I have been experimenting with. It really works and I would encourage all runners to come on board and see how much you can improve. We also rehydrated with a Hancock’s & Co. Grand Pale Ale. This is a medium sweet beer with a full round flavour. It has nice well balanced after taste on the palate. An ideal rehydration drink, made more enjoyable by the pleasant picnic like surroundings. So with a relaxing picnic on a glorious summer’s day we concluded the event. There was talk about the next event, the Tararua Mountain Race in six weeks’ time. By then the pain will have subsided, the legs will not be sore and the bruises will have healed. Like maniacs who go back for more, we will line up and spend our Saturday running through the bush again. For links to other parts of this series. Hi Don, great blog. I only declined your kind sausage offering because I'd already filed up on the free post race sausages and bread. I'll know where to go first for food next time! Great to see another runner improving their athletic prowess by implementing the sausage programme.